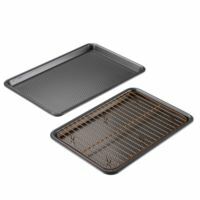 Includes: 10" x 15" Cookie Pan (Silver), 11" x 17" Cookie Pan (Silver), & Rack to fit into 10" x 15". Constructed from high-performance steel with a texturized diamond pattern that enhances browning and eases food release. Extended edges provide a sure and sturdy grip. Oven safe to 450°F, the pans feature enhanced nonstick coating for healthy cooking and long-lasting performance.. Dishwasher Safe, Hand Wash Recommended. 12-Inch Nonstick Deep Skillet With Helper Handle. Constructed from fast- and even-heating aluminum with stylish hard porcelain exteriors, the cookware features a sleek silhouette and looks great from countertop to stovetop. 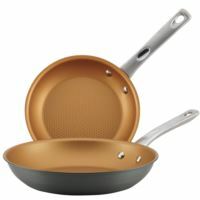 Heat safe to 500° F and features a double-riveted stainless steel handle and shatter resistant glass lid for wielding your max versatility in the kitchen.. Diamond-textured surface and enhanced nonstick coating provide long-lasting, effortless food release and easy cleanup. Colorful enamel coating resists stains while providing functional flair and easy cleanup. 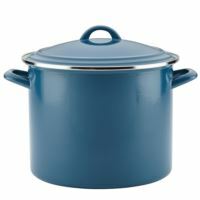 Durable enamel on steel construction generates fast, even heating. 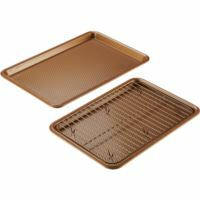 Snug-fitting lid seals in heat and moisture to quickly boil up water for pasta or melt down a cheddar-butter mixture. Oven safe to 450°F. Hand Wash. Stovetop Suitable Glass, Ceramic, Gas, Electric, Induction. 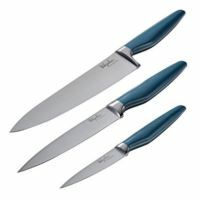 Includes: 8" Chef Knife, 6" Utility Knife, & 3.5" Paring Knife. Japanese steel blades with well-balanced handles insure long-lasting comfort and ease of use. Full tang with edges finely honed and finished for razor sharp performance. 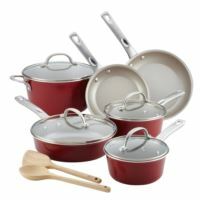 Hand Wash.
Includes: 9.25" & 11.5" Open Skillets. 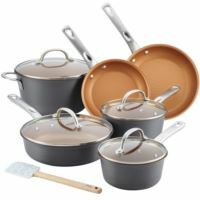 Constructed from fast- and even-heating hard anodized aluminum that's twice as strong as stainless steel in modern, flared silhouettes.. Heat safe to 500° F and feature a double-riveted stainless steel handle for confident, comfortable performance in the kitchen.. Enhanced, PFOA-free nonstick coating provides long-lasting, effortless food release and easy cleanup. Hand Wash. Stovetop Suitable for Glass, Ceramic, Gas, Electric. Includes: 1.5 Qt. & 2 Qt. Covered Saucepans, 3 Qt. 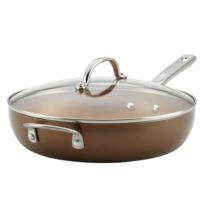 Covered Saute, 6 Qt. Covered Stockpot, 8.5" & 10" Open Skillets, 11.5" Parawood Spatula. 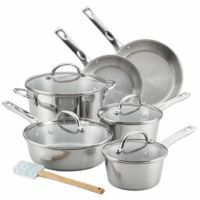 Constructed from durable stainless steel with a polished exterior and brushed stainless steel interior, the cookware looks and performs at a pro-grade level.. Double riveted handles make it super simple to handle even a stockpot full of seafood medley with fresh mussels.. Heat safe to 500° F and features laser-etched measurement markings inside the sauce and stockpots for speedy meal prep.. Dishwasher safe. Includes: 1.5 Qt. & 2 Qt. Covered Saucepans, 3 Qt. Covered Saute, 5.5 Qt. Covered Dutch Oven, 8.5" & 10" Open Skillet, 11.5" Parawood Spatula. Constructed from fast- and even-heating hard anodized aluminum that's twice as strong as stainless steel in modern, flared silhouettes.. Heat safe to 500° F and feature a double-riveted stainless steel handle for confident, comfortable performance in the kitchen.. 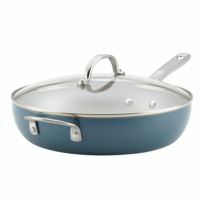 Enhanced, PFOA-free nonstick coating provides long-lasting, effortless food release and easy cleanup. Hand Wash.